PRECIA MOLEN increases its geographical regulatory scope. Along its international development, PRECIA MOLEN strives to be awarded new Legal Metrology certifications in the areas where the Group is now represented. These certifications ensure that our products meet local regulatory requirements for their use in Legal Metrology (trade use, etc…). Four of our products have been certified by the US NTEP: the i5, i20, i40 and I410 indicators. 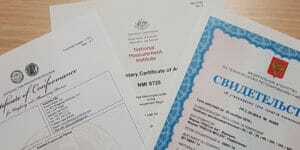 In Australia, very recently, our i5 indicator has been certified by the NMI. Finally, our ABS hopper scale and all our indicator range have been certified by Russian VNIIMS.